Riding in the car with my best friend this afternoon, hangry, hot and impatient, she asks me what I had a taste for. At any point of the day that I become hangry, knowing what I want is non-existent. A bag of trail mix would solve the problem, but I actually had an appetite for a bowl or plate of something savory. Since I was scrolling on my phone, she asked "are you looking for somewhere for us to go?" I replied, "no, I'm texting!" Lunch was on her, so I figured she'd have the spot in her back pocket. Long story short, "no" meant, RAMEN! Do you and your best friend have a place or a "thing" you always eat when all else fails? Our "no brainer" food has and always will be, ramen. For the longest time, I had been searching for a reliable Ramen spot. One where there was enough noodles, and most importantly had flavor without me having dress it up and make it good for myself at the table. Today, we found one without having to cross a bridge or pay a toll to get to- thank you GOD. I typically use Instagram to find food locations, and my best friend is the opposite, she's a Yelp-er. She knew of two in Newark,NJ that we could try locally, and I went with the newer location, The Noodle Shop & Bar. Check out the aesthetic and vibe. I like to try the newly opened establishments that aren't so popular- I like to give it a chance and then share my experience. Growing up in Newark, I remember pizza parlors, barbecue spots, Chinese stores, chicken shacks, and bodegas everywhere you turned. This new Newark we have rising and developing before our eyes is actually many blessings in disguise. I find it to be very cultural, and I am here for every new gem that rolls up and parks it on the block, ave, and boulevard. My Noodles in Newark tour started here, and I plan to try, find, and share more, but let's get into this bowl! I ordered the JimDan. 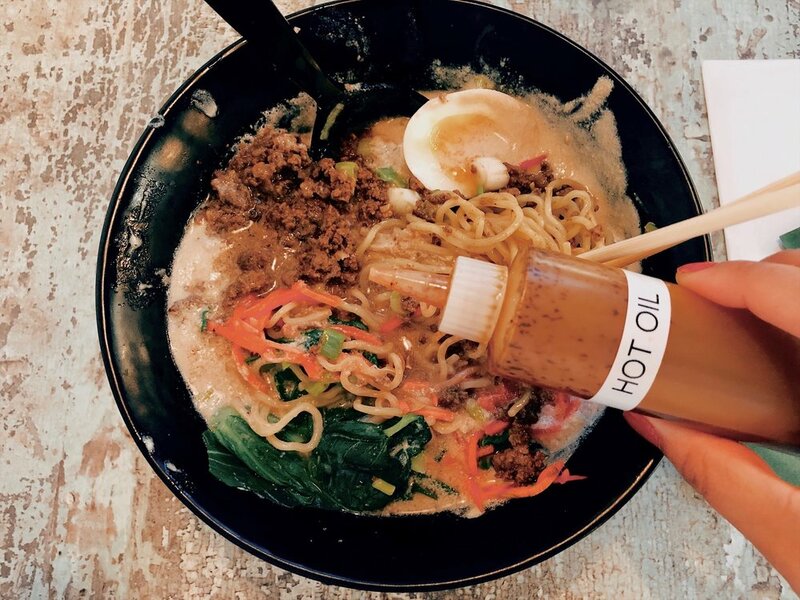 This bowl noodles with a touch of soy puree, chicken broth, roasted garlic oil, bok choy, sesame tare, topped with ground asian beef, ramen soft boiled egg, scallions, ginger shavings, and sesame seeds. When I order ramen, I don't like my noodles mushy, so I ask for them to be cooked firm. It tastes a bit more fresh to me. Also, I am used to a more watery broth, but this one was more creamy than I've ever had. In the past, I've only ever had chicken and pork, so today, I tried beef, and baby.... let's just say I'll be back! This was everything I thought it would be and more, especially once I drizzled a little of the hot oil on it. I'm a spicy girl. It was savory, filling, and the ginger added a nice kick to every mouth full! I fork it a 5/5! If you've gotten this far, you're the real MVP- and I'm sure you're hungry. And if you choose to visit, the address is 218 Market St, Newark, NJ 07102. Be sure to follow and tag @TheTasteTour, because we'd love to see what you choose and how it tastes! The only boarding passes you'll need are your taste buds. PS. The waitress told me the Lily was the most popular. I stuck to my guns, and chose what I chose. Maybe I'll try that next time. Do you see anything you'd like to try from the soup bowls?